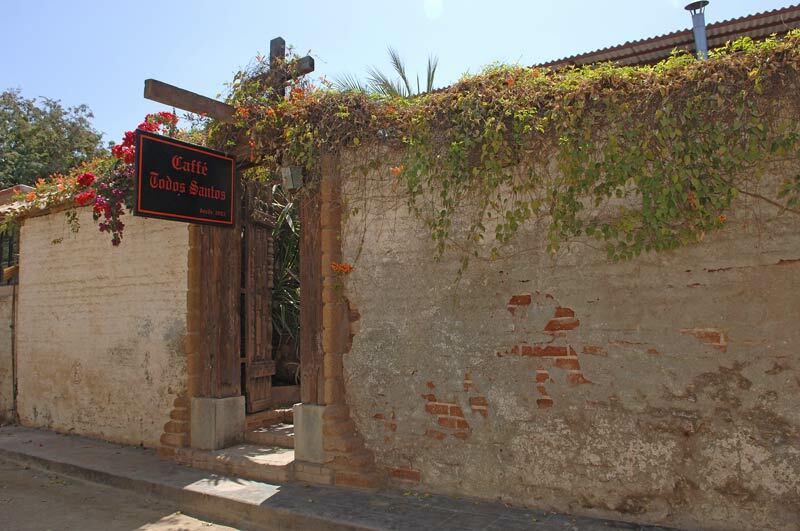 Caffe Todos Santos has become a Todos Santos classic restaurant. 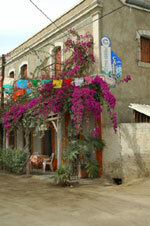 It is one of the standards in Todos Santos. 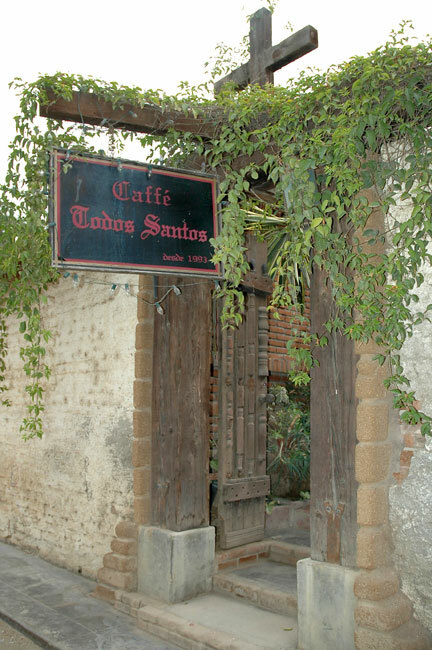 Both local inhabitants, visitors and people just passing through make this one of their favorite stops. Another of the nice old homes that graces the magical village has made its resurrection to serve and satisfy the palate of the public. This great standby has entrances on two parallel streets, Calle Centenario and a courtyard entrance on Calle Miguel Legaspy. The edifice is a time worn structure on the slightly funky side. There are three main dining areas: a street side cafe area covered by an ivy coated overhang next to the main entrance. 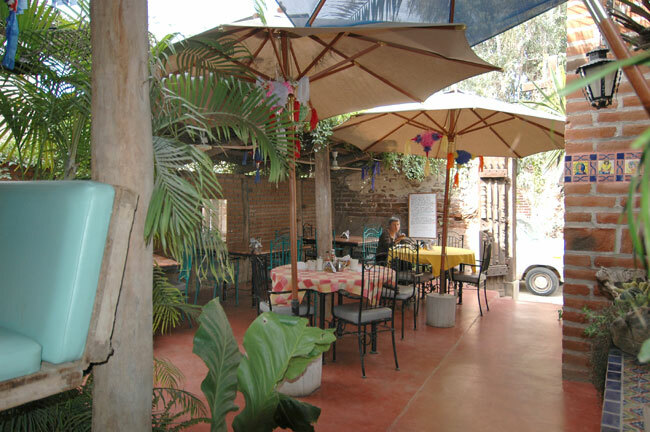 There is an indoor space inside the entrance near the coffe machines and pastries surrounded on the walls by art created by local artists and there is an outdoor courtyard area on two levels covered agian with vines, trees and other plantings. Comfortable seating in a very comfortable relaxed dining atmosphere has been created for the dining experience. The food is all excellent with emphasis on good fresh ingredients. Especially good are the baked goods. The breads, muffins and cookies are among the best and fresh baked on the premises daily. They are also for sale to go. The menu consists of a very comprehensive breakfast selection to big delicious sandwiches, tasty filling soups, excellent salads and a good assortment of Mexican dishes. All are served in generous portions. You often have plenty left to take home. The service in addition to the atmosphere is relaxed but worth any wait that may be incurred. Whether for breakfast or lunch, this is where the locals congregate. Don’t make the mistake of ordering separately; the deli sandwiches are huge, as are the fresh salads, again, sufficient to share. Try the popular Cobb Salad, or the Mediterranean with fruits, nuts, Greek-style cheese and raspberry vinaigrette. Soups made daily come with the house bread. Mexican dishes take on a different slant. Try the flautaschicken marinated in coconut milk with a hint of curry then wrapped in a tortilla and fried, topped with mango salsa. Fresh local fish might be wrapped in a banana leaf with coconut milk or baked in foil. Thin-crust gourmet pizza is offered on Friday night (seasonally) with all kinds of toppings from which to choose such as chicken with Alfredo sauce and roasted garlic. The restaurant was established in 1993 and is the brainchild of chef/owner Marcus Edward Spahr. You can enter from either street, walk through the kitchen and sit in the lovely courtyard, in the dining area, or street-side under cover. Open Tuesday to Sunday from 7am to 9pm and Monday from 7am to 2pm.